The Whole Megillah (TWM): Why a memoir and why now? Morris Dickstein (MD): Well, I’ve reached a certain age and can’t help noticing that I’ve put on some mileage. There are worlds I wanted to revisit and recapture. Also, after quite a lot of critical and historical writing I wanted to do something more personal, to tap into a different part of the brain and write in a different voice—more evocative and less analytical, ?more narrative and less argumentative. And why not, since I’ve always thought of myself as a writer, not strictly a critic? TWM: How much do you think your yeshiva upbringing factors into your writing style? MD: I doubt it affected my writing style but it certainly affected the life I’ve lived, with one foot in the Jewish tradition and another in the secular world–exactly how my day was split when I was a yeshiva student. ?My yeshiva training?also affected me as a critic: I became very comfortable not only with the whole process of commentary and interpretation but also with a certain reverence for the written tradition, even as secular texts, themselves hallowed by time but ripe for reinterpretation, gradually took the place of religious texts—scripture, Mishneh, the whole nine yards. Anne Marie Bompart: One motif of the book is your focus on identity struggles and dislocation in regard to your Jewish heritage, especially as you rebel against the structure and rules of orthodoxy. To what extent does the book explore your Jewish identity? To what extent has your heritage influenced your studies and/or academic trajectory? 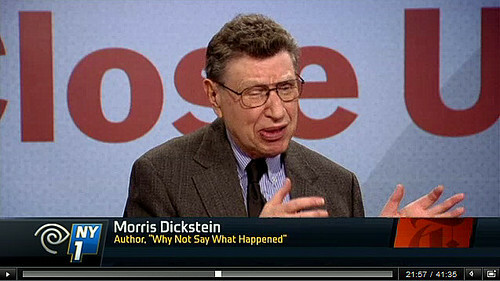 Morris Dickstein: I did have a fairly orthodox background that was a permissive background, and I didn’t react against it with hostility or anger, I just gradually distanced myself from parts of it. And certainly, the emphasis on reading and on texts in my Yeshiva study went well with my work as a critic and someone doing literary interpretation. I think there’s a long scholarly tradition in Judaism that certainly I encountered in 12 years of Yeshiva study. I probably applied it in some way to secular pursuits. It was a kind of natural transition. Morris Dickstein [is] not only one of America’s most perceptive literary critics, but also one of our best critical writers […] a penetrating work of cultural history like this one gives the reader who holds fast to it a sense of dwelling in a circle of illumination amid all the shadows. Podcast of an interview conducted by WABE’s Valerie Jackson. Video of interview conducted by Lewis Lapham on bloomberg.com. Interview with WNYC’s On the Media. Audio of interview for Zefrey Throwell’s Frank Prattle. October 2009. New! Interview with Prairie Public Radio. September 8, 2010. Q: What was it like to find that a project you’d been working on for years suddenly turned out to be all too timely? A: I actually began working on it in the Reagan era, when it was timely, since Reagan set about to upend the New Deal consensus in many ways, especially about the role of government in our lives and about our need, beautifully articulated in FDR’s second Inaugural address, to take collective responsibility for each other, and especially for the worst off among us. My wonderful editor at Norton, Bob Weill, said “I would have bought this book even without the financial meltdown.” I reminded him that he did — two months before. But I’m sure this timeliness is responsible for much of the attention the book has received, including an amazing number of reviews and pretty healthy sales. The Author Speaks: Art in Times of Despair. Interview conducted by AARP Bulletin Today’s Krista Walton, October 2009. 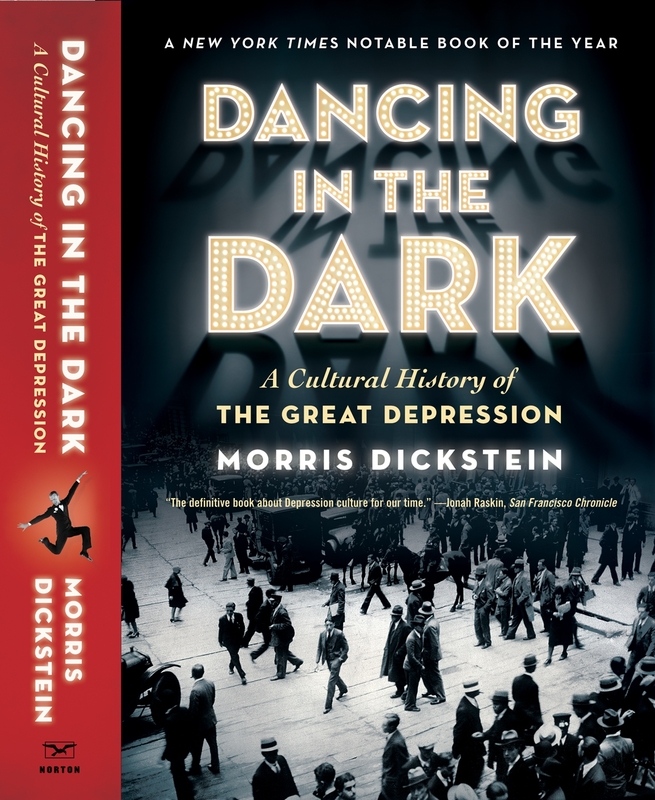 In Dancing in the Dark: A Cultural History of the Great Depression, Morris Dickstein dives into art of the 1930s and explores what he calls the “inner history” of the Depression—the country’s collective hopes, insecurities, dreams and fears that sprang from dark financial days. Dickstein talks to AARP Bulletin Today about why times of social crisis can inspire artists and what that might mean for culture today. And I said, ‘Well, no. That was certainly important, but it’s actually the movies of the thirties that first drew me in.’ ‘The movies of the thirties?,’ she said, incredulously, looking somewhere between puzzled and disapproving. Most intellectuals, like most other Americans, actually loved the movies, but couldn’t take them seriously. free signup bonus no deposit mobile casinoInterview with Morris Dickstein by the Dallas Morning News’s Chris Vognar. Quoted in the Press-Enterprise on psychological and cultural effects of the current economic downturn. Dreamer. 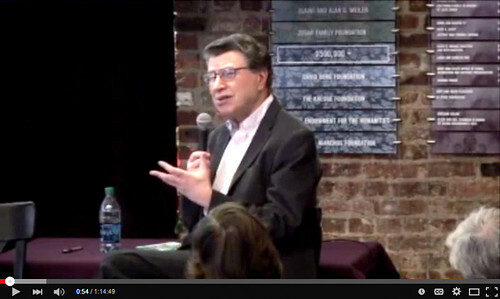 A Podcast with Liel Leibovitz about Delmore Schwartz. Tablet Magazine, posted August 11, 2011. Frank Capra Revisited. An interview with the Ave Maria University Film Society. Between Generations. A lengthy interview on the changes in the field of literary criticism, ranging from the 1950s to today. Conducted by Robert Boynton for the Minnesota Review, and later reprinted in Critics at Work: Interviews 1993-2003.